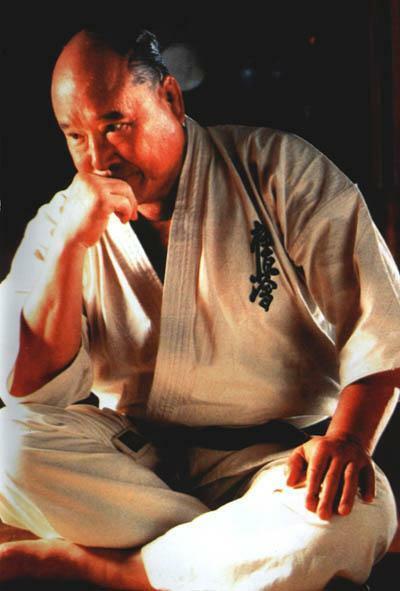 Masutasu Oyama, founder of kyokushin karate, may be the toughest martial artist of all time. Oyama, was born Yong-I Choi, on July 27, 1923, in the tiny village of Wa-Ryongri Yong-chi Myonchul Na Do, in Southern Korea. His family, considered aristocrats, belonged to the Yangban-clan. His father, Sun Hyang, was the mayor of Kinje, a town near the village where Yong-I Choi was born. As a young child, nine years of age, Oyama began studying Southern Chinese Kempo under the instruction of Mr. Yi, an employee on the estate owned by Oyama's father. Oyama was also an avid reader and was deeply affected and moved after reading the biography of Otto von Bismark (1815-1898) the Prussian Chancellor (1871-1890) of the German empire. Bismark, Oyama read, was instrumental in unifying Germany in a span of only two to three years, making it a nation powerful enough to control most of Europe. The philosophy of Bismark made such a strong impression on Oyama that he decided he wanted to be the Bismark of the Orient. With great aspirations Oyama somehow felt his destiny was in Japan and he left Korea at the age of fifteen. It was at this time in Japan the young Choi changed his name. He adopted the name Oyama from the family that befriended him and took him in, while in Japan. In 1938, at the young age of fifteen, Oyama wanted to serve the country he now called home and therefore joined Japan's Yamanashi Youth Air Force Academy with the intentions of becoming a pilot. In September of this same year, Oyama became a student of Gichin Funakoshi, Shotokan Karate founder, at the Takushoku University. Funakoshi, a school teacher from Okinawa, was credited with introducing karate to Japan. It is this man that Oyama later would refer to as his true karate teacher. Throughout the years Oyama always spoke highly of Funakoshi, remarking in later recollections of his gentle yet overwhelming presence. Oyama went on to say that of the many things he learned from Funakoshi, kata (formal exercises) was the most important. By the age of eighteen, Oyama had earned the rank of nidan in karate (second level black) rank. Oyama was still very much a patriot and was always volunteering for special military duty. On one assignment to an airfield near Tokyo, a confrontation provoked by an officer, resulted in Oyama striking the officer. Although found innocent, due to the provocation on the part of the officer, Oyama was ordered transferred to an area in the Pacific. However, the war was just ending and lucky for Oyama, the transfer was halted. But this luck had an ironic twist for Oyama because it also meant that his driving quest to serve his new country was now over. The announcement that Japan had surrendered WWII quickly ended Oyama’s military career. The stress of losing his career and the dishonor he felt for his adopted country losing the war created great - almost unbearable - stress in Oyama’s life. Oyama found someone Korean like himself by the name of Nei-Chu So. Not only was So Korean but he was also from the same province. Nei-Chi So was a practitioner of the Gojo-Ryu style of karate. 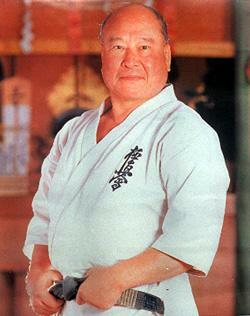 Gogen Yamaguchi, nicknamed "The Cat", was carrying on goju-ryu, founded by Chojun Miyagi in 1930 in Japan. Yamaguchi commonly acknowledged that Nei-Chu So was one of his best students. Oyama quickly resumed his martial arts training under So and a strong bond was formed between the two. So, a great philosopher and strong in character, possessed even stronger spiritual convictions. Oyama would not only learn Goju-ryu from So, but would also be sanctified by him into the Buddhist faith of the Nichiren sect. It was So who inspired Oyama to make karate his life long dedication, propelling him to face his own challenges and develop his own achievements and victories. At the same time he began his training with So, Oyama earnestly took-up the practice of Judo as well. After four years of training, he received his yondan (fourth level black) ranking in Judo. Oyama liked to attend the local dance competitions in the area in order to socialize and relax after his martial arts training. It was at one such dance event that Oyama came to the aid of a female who was being accosted by a local troublemaker. When Oyama intervened, the troublemaker, a tall Japanese suspected of several homicides, became enraged and produced a knife. Taunting Oyama, the troublemaker made continuous slashing movements through the air in front of Oyama’s face with the knife then lunged towards Oyama. Oyama blocked the attack and delivered a forceful punch to the head of the assailant, killing him instantly. Because of eyewitness accounts of the incident, Oyama was ruled by the courts as justified in using self-defense. However, the impact of the tragedy devastated Oyama. To kill a man with a single blow was so overwhelming to Oyama that he decided to give up his martial arts training. Learning that the man he killed had a wife and children on a farm in the Kanto area near Tokyo, Oyama went to the farm and worked there for several months. He did not leave until the widow assured him that she was financially capable of maintaining the farm and that she did not hold Oyama responsible for the death of her husband. This became the turning point in Oyama’s life. His Goju-ryu instructor, Nei-Chu So advised him to go away, to train his body and soul and to give karate a chance to control his life. Oyama, lacking direction and a goal wondered if karate was a realistic goal. Would karate training give him the much-needed control of his physical strength as well as mental discipline? If karate would provide these traits, then he would have to give himself completely to the training. He realized it would be a long, hard journey. He was determined to succeed on this quest. In 1948 Masutasu Oyama, taking with him only his books and the basic necessities for cooking, began an arduous training regimen atop Mt. Minobu in Chiba Prefecture. Mt. Minobu is the same place where the famous seventeenth century samurai, Miyamoto Musashi, received inspiration for Nito Ryu, his celebrated double sword system. To Oyama, this was the ideal place to train and be inspired in the same tradition as his idol, Musashi. Of the books Oyama took with him on this journey, none were more important than the collection on Musashi, by Yoshikawa. For eighteen months, isolated in the mountains, Oyama tested himself against nature’s elements with such scenarios as training and meditating under icy waterfalls, performing countless jumps over bushes and boulders and using trees and rocks as makiwaras (striking aide, see photo below) to condition his hands, feet and legs. He would begin training at five in the morning, running up the steep slopes. Using large rocks as weights, he would lift them hundreds of times to increase his strength. 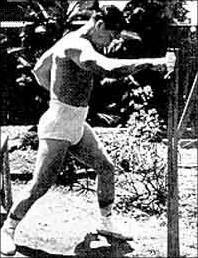 In addition, he performed kata a minimum of one hundred times each day as well as hundreds upon thousands of repetitions of kihons (basic techniques), continuously pushing himself to the limits of human endurance. At the conclusion of his daily training, he would read various Buddhist writings and sit in zazen and meditate. It was also at this time that Oyama began to contemplate the idea of the circle and point for his karate. He also began visualizing himself defeating a bull with his bare hands. If he could get strong enough and powerful enough that he was able to defeat a bull with his karate, he would become famous. But it wasn’t fame he was after. The fame, he thought, would be a tool. If he could attract interest from others, he could enlighten them on the strengths and virtues of karate and he would succeed not only in his goal of mastering karate, but of instructing others in the way of karate as well. After eighteen months of solitude, Oyama returned from the mountains. Shortly after his return from the mountain training, the first karate tournament since the end of World War II, was held in Japan. Oyama competed in this All Japan Karate Tournament held at the Maruyama Kaikan in Kyoto and emerged victorious - the tournament’s first champion. But Oyama was an intense young man and still was not satisfied with his achievement. He still felt that something was lacking in his martial arts and that he had not truly reached his full potential. Oyama returned to the mountains for another year of gruelling fourteen-hour training days. To this day, there is no other person who has undertaken such a training regimen within the martial arts. After this final isolation and training period, Oyama returned to civilization ready to apply all that he had learned. It was at this time Oyama decided to apply his karate expertise in a life and death battle - a conflict that would set man against beast. Masutasu Oyama, in order to show the strength of his karate, tested his strength by fighting raging bulls bare-handed. It was a mismatch from the get-go for the bulls, not for Oyama. In all, he fought 52 bulls, three of which were killed instantly, and 49 had their horns taken off with knife hand blows. That it is not to say that it was all that easy for him. Oyama was fond of remembering that his first attempt just resulted in an angry bull. 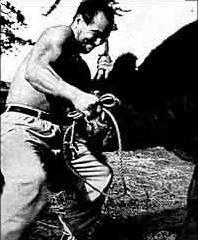 In 1957, at the age of 34, he was nearly killed in Mexico when a bull got some of his own back and gored him. Oyama somehow managed to pull the bull off and break off his horn. He was bedridden for 6 months while he recovered from the usually fatal wound. Today of course, the animal rights groups would have something to say about these demonstrations, despite the fact that the animals were all destined for slaughter. In 1952, he travelled the United States for a year, demonstrating his karate live and on national television. During subsequent years, he took on all challengers, resulting in fights with 270 different people. The vast majority of these were defeated with one punch! A fight never lasted more than three minutes, and most rarely lasted more than a few seconds. His fighting principle was simple — if he got through to you, that was it. If he hit you, you broke. If you blocked a rib punch, you arm was broken or dislocated. If you didn't block, your rib was broken. He became known as the Godhand, a living manifestation of the Japanese warriors' maxim Ichi geki, Hissatsu or "One strike, certain death". To him, this was the true aim of technique in karate. The fancy footwork and intricate techniques were secondary (though he was also known for the power of his head kicks). These life and death struggles brought notoriety to Oyama. Oyama used this notoriety to help establish his Kyokushin organization. 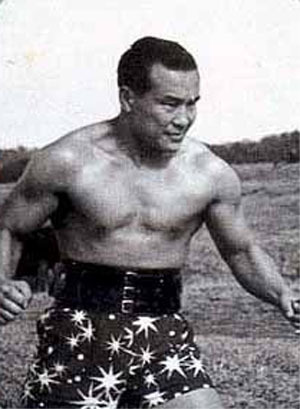 Oyama's reputation grew with each bullfight and each challenge match, as he defeated wrestlers, boxers and judo stylists alike in no-holds-barred bouts. He was an equal-opportunity fighter, taking on any man from any combat system who wished to challenge him. For nearly fifty years, fifteen million plus members of Oyama's worldwide Kyokushin Karate organization witnessed this man's incredible feats. Whether from the power of his strikes, the strength of his handshake, his remarkable teachings or through the teachings of the instructors and branch chiefs that Oyama produced, everyone associated with him knew that this esoteric name was not inappropriate. Oyama was a living legend until he passed away April 26, 1994, at the age of 71. He could fight and defeat a bull or another man with little problem; they were tangible opponents that appeared before him. But lung cancer was a hidden enemy, sneaking around inside Oyama's body and tearing it asunder day by day. He couldn't beat the disease with his fists or his feet. Nor could he devise a strategy to ward it off. For years, the cancer ate away at his insides without him even knowing it was there. His death was met with sadness in not only kyokushin circles, but the rest of the martial arts community as well.